Saturday turned out to be a pleasant day for Bike Fun. 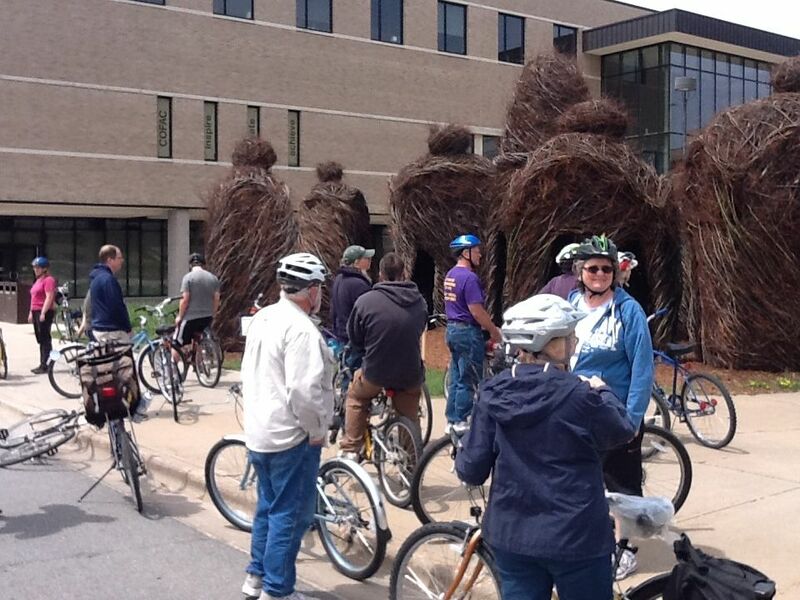 The Streetside Abstract Sculpture Ride engaged 20 Poky Pedalers in an 11-mile tour of a half-dozen of Stevens Point’s notably large art installations, each sited just off our public streets. Scattered about our city, some of these sculptures were easier to interpret while others inspired a fair amount of head scratching. Starting from Goerke Park, our first stop was at the UWSP sundial to observe “The Garden of Curiosity”, the recently-constructed environmental sculpture of giant hut-like structures made of maple, willow, and dogwood saplings. The artist, Patrick Dougherty of Chapel Hill, NC, has built about 200 similar works around the world over the past 20+ years. The UWSP piece was completed in mid-April after 3 weeks of work by community volunteers under Mr Dougherty’s direction. From there, we headed west to Second Space, a sculpture garden on Second St between Franklin and Portage. Steph Jones, the artist who lives there, gave us a tour of her space and some explanation of how she creates her art. PPSP thanks her for showing us around and allowing us to explore her sculpture garden. The Sculpture Park was our next destination. After a lingering pedal past the numerous works there, we focused on the colorful metal piece by Estela De Paola De Lerma entitled “Three Colors One Heart”, the solitary streetside sculpture located on North Second St. Turning east, we rode to see “Ralphie and Gimmy” – two large metal sculptures representing a golfing dog and a giraffe, each incorporating a discarded propane tank – in front of a private home off of North Reserve St. While we were there, the artist (and the person who lives there) happened to drive up and gave us some background on these works. I did not get his name, but PPSP appreciates his willingness to talk to us about his art. Our next stop was near Park Ridge where “Figure Holding Box”, made from I-beams and other metal pieces, unobtrusively stands in front of another private home. Finally, we visited “Ascension”, a steel, hemlock, concrete, and field stone work sitting on Main St in front of the Pineries Bank near the new Copps market. 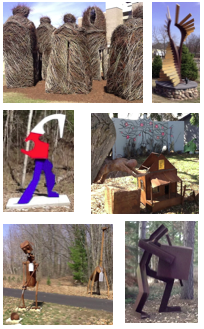 This is a 2009 work designed and created by a UWSP public sculpture class. Most Fun – the most coveted award for any PPSP Bike Fun event. Each piece was rated in each category from 1 to 10, with the awards going to the pieces with the highest average rating. The Most Artistic award went to “The Garden of Curiosity” with an average score of 7.8 out of 10. The Most Abstract award went to “Three Colors One Heart”, with an average score of 7.3 out of 10. The Most Fun award went to Second Space, with an average score of 7.9 out of 10. And thanks to all the Poky Pedalers who lent their expertise in judging all the wonderful art we viewed. 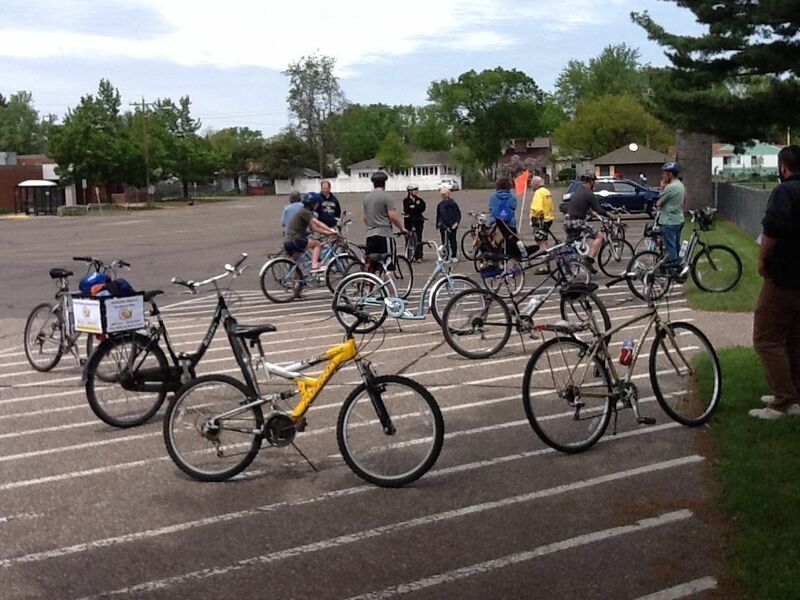 There is still lots more Bike Fun to enjoy this year with PPSP. Check out the list of upcoming Poky Pedals here and the entire 2013 Bike Fun Calendar here.